Sea Turtle Camp’s Open Water SCUBA Camp gives teens the chance to explore the beautiful world below the warm, clear waters of the Atlantic Ocean! Are you a teen passionate about marine biology? If so, join other teens as you discover what lies below the ocean’s surface. Get certified and dive feet first into adventure this summer, during Sea Turtle Camp’s 12-day scuba camp session! 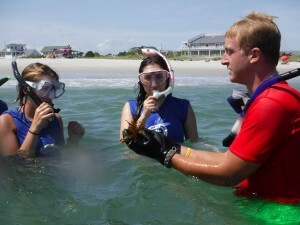 When not discovering the undersea world, campers explore North Carolina’s coastal environment, through hands-on, feet-wet marine science activities. SCUBA campers visit The Karen Beasley Sea Turtle Rescue and Rehabilitation Center. At the sea turtle hospital, teens get a first-hand look at what it takes to care for and rehabilitate injured sea turtles. Sea Turtle campers also get the chance to go behind the scenes at the North Carolina Aquarium and participate in a surf lesson or stand-up paddleboarding eco-tour! SCUBA Camp: Prepare for College & Career! Are you thinking about a college degree in marine biology? If so, scuba diving is an essential skill for any future marine biologist. Taking a deeper dive into the world of marine biology through our Open Water SCUBA Camp program is the perfect beginning! Sea Turtle Camp campers are trained by PADI certified dive instructors. These instructors are some of the best divers on the East Coast! After completing their certification course, campers participate in several open water dives in the area, explore sunken shipwrecks and more! In the future, perhaps you’ll enjoy one of the many perks of this career field – diving on the job! While many others are in an office all day – marine scientists are enjoying the ocean on dives! 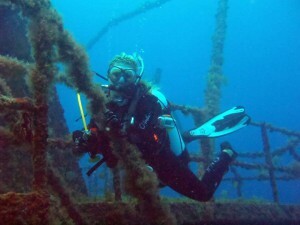 As a PADI diver, career opportunities abound. Interested in learning more? Please click here to learn more about the program or to enroll! For any questions about Sea Turtle Camp’s Open Water SCUBA program for teens, please contact us. We look forward to exploring the unique world of sea turtles with you!